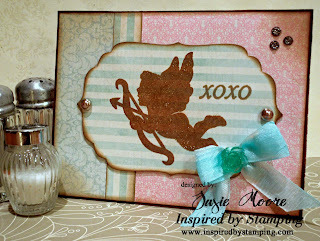 Welcome to the second day of our January Inspired By Stamping Blog Hop. If you can just wait a day, you will be able to buy the newest stamp sets tomorrow. And I will have the full reveal right here for you to see. For my card today, I used the same set as yesterday's only I used this precious cherub stamp and another sentiment. I wanted him to sparkle a little so after my inked image dried, I rubbed a bit of platinum Stickles over the image. Just the right amount of sparkle!! I used papers from My Mind's Eye and a Spellbinders label die on this project. The bow is colored with a Copic marker and the little resin flower is one I made from a resin cast. Tomorrow I will be back with another project to show you AND the reveal of the stamp sets. Be sure to look at what all the very talented designers have for you by clicking each link below. So full of love as it should be with those sets! Beautiful card, I just love the pretty colors you used! so soft and pretty! I can see the shimmery paper in the picture which is sometimes hard to photograph well. beautiful! that extra shimmer is perfect! Your mini album is just lovely! Gorgeous card!! I love your little details! !